Jacki is a nationally certified physician assistant specializing in medical and surgical dermatology. She was employed by Sutton Ryan Dermatology in Lincoln, Nebraska for nearly 20 years and worked with Drs. Margaret Kontras Sutton and Robyn Gembol Ryan. Ms. Kment graduated from Dordt College in Sioux Center, Iowa and then completed physician assistant training at the University of Osteopathic Medicine and Health Sciences in Des Moines, Iowa. She then earned a Master’s Degree in Physician Assistant Studies with a specialization in dermatology from the University of Nebraska Medical Center in Omaha, Nebraska. Upon completing PA school in 1994, she spent three and a half years in primary care, which included over two years in the National Health Service Corps. She has worked exclusively in dermatology since 1997 and has special interests in acne, psoriasis and skin cancer. Jacki currently serves as Vice Chair of the Dermatology PA Foundation and is the Leadership and Professional Development Chair of the Society of Dermatology Physician Assistants. She is also honored to be the Founder and Past President of the Nebraska Dermatology Physician Assistants and has served as the inaugural mid-level board member of the Nebraska Dermatology Society. Jacki is married to Rick Kment and they are blessed with two sons, Cole and Quinn. In her spare time, Jacki enjoys spending time with her family, attending sporting events, enjoying ATV adventures and trips to the lake and boating. She also enjoys home decorating, swimming and spending time outdoors, landscaping. Crystal was born and raised in western Nebraska. She went to Minneapolis, Minnesota to attend Northwestern College, where she met her husband, David. She later finished her schooling at the College of St. Catherine in 2000 with a degree as an Occupational Therapy Assistant. David and Crystal were married in 2001. After working a few years in the Minneapolis/St. Paul area, David and Crystal then moved back to western Nebraska where they started their family and were blessed with three children, Mallory, Noah and Whitney. Crystal has worked as a Certified Occupational Therapy Assistant since 2000 in various settings and with all ages. After living there for 12 years they moved to the Lincoln area where they continue to live, work and raise their family. Crystal has a love for God and also for people. This has led her to become involved in many volunteer opportunities through church and the community. Outside of work, Crystal enjoys music, spending time with her family, attending her children’s events, hiking, biking and gardening outdoors. Integrity Dermatology has allowed Crystal to develop new growth in her interests and education in the field of dermatology and she also maintains her work in Occupational Therapy. She is thrilled to be a part of the Integrity Dermatology team. 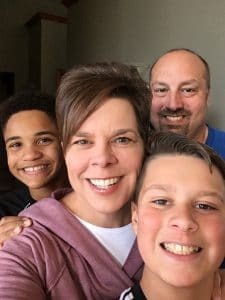 Amanda Schiermann was led to the medical field by her love for people and her love for the Lord and has worked serving others in healthcare for over 11 years as a CMA. She is passionate about caring for others physically, but she also cares for their spirits with a compassionate and genuine heart in an effort to heal and help. Her desire to help others has also prompted her to serve over 200 volunteer hours in hospitals and animal shelters. Memorably, she has served in taking dogs from local shelters for visits to area retirement homes. In addition to loving her job and volunteer service, Amanda is very devoted to her family. She has been married to her husband, Tim, for ten years and they have two beautiful daughters, Cianna and Emma. They keep busy with soccer, trips to the park, going for walks, playing games and spending time with their extended family. Amanda also has a successful photography business where she enjoys capturing the love and joy of families and relationships. She is excited to be a part of the Integrity Dermatology staff. Diane graduated from Emporia State University with a degree in Business Administration. She has spent the majority of her career in the customer service industry. Most of this time has been in the insurance field including agency, claims, underwriting and, most recently, working in a customer call center environment. Diane has been married to Bruce for 38 years. They have two sons, Tyler and Brad. Tyler lives in Austin, Texas with his wife, Melissa, and their daughter, Kendall. Brad lives in Kansas City, Missouri with his wife, Jenny, and their daughter, Taylor. In her spare time, Diane enjoys spending time with her granddaughters, golf, water aerobics, yoga, scrapbooking and reading. She also has enjoyed some adventurous hobbies including scuba diving and skydiving.